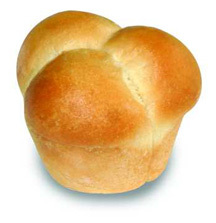 not my actual roll...for illustrative purposes only. You may recall that I spent Christmas 2010 with Rose Levy Berenbaum’s Bread Bible recipes for dutch baby and dinner rolls. Both recipes were so successful and made the day feel like a holiday should that I decided that Rose should be part of Christmas 2011. Specifically, I wanted to make a batch of cloverleaf dinner rolls so that I could give the Proof setting on the Advantium a whirl. I was hoping for a Christmas miracle to be honest. My luck with getting bread dough to rise is spotty. I follow directions, I use water that is neither too hot nor too cold, I use high quality yeast, and I try my best to surrender my fears to the bread gods. Maybe our house is a bit on the chilly side. Or maybe I have evil spirits in the air taking all the mojo out of the yeast. Or maybe I just needed the Advantium to banish those evil spirits and unleash my bread baking super power. The first rise of the dough was glorious. When I took it out of the Advantium, it had grown as though any other outcome was simply inconceivable. I deflated the dough, gave it a turn or two, and set it back in the Advantium on Proof for the second rise expecting that my good fortune with the first rise must have been a fluke. Not so. The second rise was as perfectly executed as the first. I then portioned the dough, rolled each portion into balls, and set three dough balls into each cup of a muffin tin. While the big oven heated, the dough went back into the Advantium for the final rise. Once the dough had achieved about 3/4 of the final rise, my impatience got the best of me. I brushed melted butter on the top of the rolls, gave them a generous dusting of kosher salt, and set them in the oven to fulfill their cloverleaf destiny. If I had a been just a bit more patient on the final rise, my rolls would have achieved maximum lift when they hit the intense heat of the oven. But I wasn’t. And they didn’t. And in spite of that, they still emerged golden brown and I eagerly pulled one apart to enjoy its salted, buttery deliciousness. Is there anything better than bread, still warm from the oven? The correct answer is no. The rolls that we didn’t eat with Christmas dinner were carefully wrapped in plastic and stashed in the freezer. I think they lasted all of two weeks before we had picked the last one off. Which means that I am long overdue to set a bowl of flour, yeast, and water in my Advantium and harness the super power of the Proof setting. Want the recipe that I used? Click here to jump back in time. The only thing I did differently this year, besides proofing the dough in the Advantium, was letting the starter develop in the refrigerator overnight. Yes, it added even more time to an already lengthy recipe but it wasn’t like I was doing any more work. i like Rose Levy Berenbaum, you know that, tho i haven’t touched her book in a year… it’s hard incorporating her recipes into a non-dairy diet but i like her work. There is indeed nothing like fresh bread. My mouth is watering just thinking about it. I’m glad you found success in the world of yeast! Jenna, I don’t know what your personal relationship with home baked bread is like.� But these rolls?� Totally worth all the time that goes into them. And yes, the Advantium definitely came to my rescue with the Proof setting. Buttery, fresh rolls sound amazing. It sounds like you and yeast are becoming good friends. Will there be more bread in the future? I really hope so.� Even if it is only so that these beauties are constantly stocked in my freezer.� I personally loved what a sprinkle of kosher salt did to the tops.� I’m drooling just thinking about it. These sound more than worth the effort. Oh my, one would be so nice with my morning tea right now. I really like the idea of the proof setting too, knowing you will have a consistent temperature and no drafts. These rolls would be delightful paired with a smear of jam and cup of tea. Who knows, maybe I will stuff some of these into my bag and bring them to Potluck this summer. I’m gonna take next weekend and learn to make Biskets….. Guy, these rolls take some patience.� But the end result, even without the fancy proofing box, is worth it. You know what goes great with these babies??? Butter.